This function is not fully developed yet - including its name. It can be referred to as LoMaps POI elsewhere in this Manual. LoMaps are based on the OpenStreetMap Data and are rendered directly in Locus Map application via MapsForge toolbox. The maps cover the whole World and are available in map packets covering individual states which can be purchased and downloaded solely for offline use. Database of OpenStreetMap points of interest is an integral part of LoMaps. In Locus Map it can be displayed not only on maps (actually on any map of an area covered by downloaded LoMaps) but also as an autonomous database on which browsing and search can be performed. 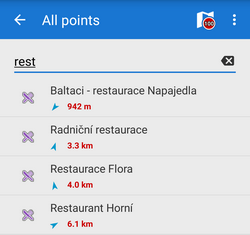 - when particular points are selected, the button changes and displays number of them on the map. 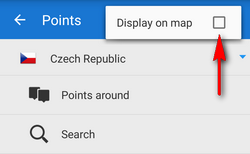 Tapping this removes highlighting of selected points on map. LoMaps file - select a file with POI database. It is identical with the LoMaps file. It is possible to select one file only. Search - fulltext search of POI. Typing first few characters returns results that can be further precised. LoMaps POIs database consist of a structure of folders with points of particular categories, e.g. Accomodation, Financial&Post services, Culture&Tourism etc. Each category is sub-divided into subcategories and also contains a special parameter “around” that allows to browse points around current location of user. 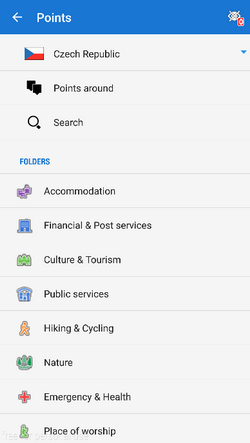 Points in a selected folder can be highlighted on map by tapping button in topbar (showing also number of points in the selected folder): Selecting a particular point displays its detail info screen. 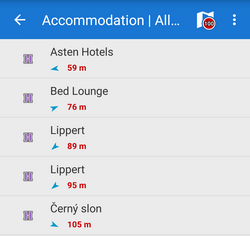 All points in folders are always sorted by distance from the map screen cursor (or from the user's location if the device is GPS fixed and the map centered). It is not possible to import LoMaps POI. Only highlighted display is allowed. Full text search of names and keywords. E.g. keyword “pub” returns all points with “pub” in their name, description or amenity. All dynamic points of interest can be deactivated - removed from map. Only passive symbols in the map remain. Tap in the topbar and uncheck Display on map. LoMaps Points of interest database (mapname.osm.db) can be used only when a corresponding LoMap map file (mapname.osm.map) is present in /mapsVector directory. If the map file is removed (e.g. due to saving space for use of other map) the POI file cannot be initialized.